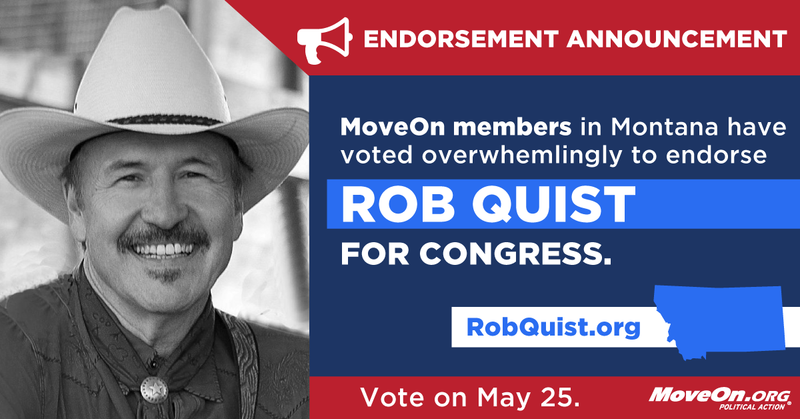 MONTANA — Montana members of MoveOn.org Political Action have voted overwhelmingly to endorse Rob Quist in the U.S. House special election in the state with 99% of votes cast in favor of backing Quist, and praising Quist’s progressive policy agenda, including his commitment to protect the Affordable Care Act and fierce opposition to repeal efforts. The special election is to replace Republican Rep. Ryan Zinke, who resigned after being appointed Secretary of the Interior. Quist, a lifelong Montanan and well-known folk and bluegrass musician, has emerged as a strong progressive candidate and a vocal critic of the current Republican plan to dismantle the Affordable Care Act. Quist has also served as a cultural ambassador to Kumamoto, Japan through the state’s commerce department and served for more than a decade on the Montana Arts Council, leading an effort to implement anti-bullying and art programs in the state’s public schools. MoveOn’s endorsement of Quist builds on an endorsement by MoveOn members in Georgia of Jon Ossoff in showing that, if Republicans advance efforts to repeal the Affordable Care Act or advance Trump’s dangerous agenda, they’ll pay a political price. This week, House Republicans are expected to rush through a bill that would be a disaster for Montana. Studies have shown it would raise premiums by up to $12,000 for older Montanans and take away health coverage from an estimated estimated 75,000 Montanans. Republican Greg Gianforte and Libertarian Mark Wicks each earned less than 1% of votes cast.MoveOn.org Political Action represents the collective will of MoveOn’s members at the ballot box by helping to elect progressive candidates.